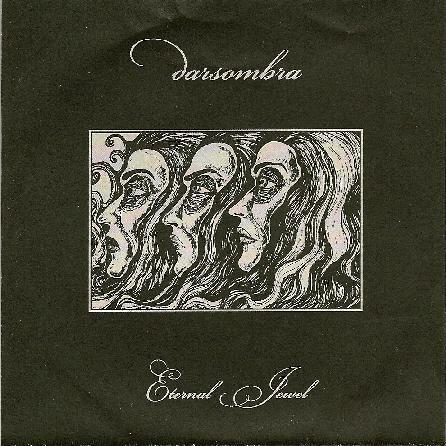 Darsombra, the nom de plume of guitarist Brian Daniloski, inhabits the gray nether regions of 21st century experimental music where traditions as disparate as musique concrete, industrial, ambient, noise rock and neoclassical merge into a seamless continuum of sound. If a definitive cinematic version of At the Mountains of Madness is ever made, Eternal Jewel should be the soundtrack. It roils and seethes with the same kind of impending doom and claustrophobic menace as Lovecraft's unforgettable masterpiece of horror. The high gothic imagery many of the songs on Eternal Jewel conjure in the imagination is due, on the one hand, to titles such as "Night's Black Agents," "Drops of Sorrow" and "Incarnadine" but also to the deliberately amorphous character of the compositions themselves: dark, brooding, solemn obituaries for dead souls adrift in the mechanized, fully automated nightmare of an urban hell. Daniloski's guitarscapes are rarely discernible as emanating from something as quaint as a Gibson Les Paul; rather, they sound like the crescendo of Gregorian choirs in the underworld, massed string sections from the halls of Pandemonium itself or the infernal machines that grind and digest the bones of the damned as they clamor for redemption at the cloven hooves of the Dark One. Only on "Lamentings/Auguries" does Danilowski's guitar actually sound like a guitar. Here each successive guitar seems to rise almost in a pyramidical structure until the whole piece towers Babel-like toward some incomprehensible assignation with the mysteries of the deep. One can almost hear the chant of "tekeli-li" rising out of the cauldron of sound as the piece abruptly shuts off. Eternal Jewel is really exquisite listening in the hours long after midnight has tolled. But beware: the voice of the Eldritch calls for you from the charnel pit. For more information you can visit the Darsombra web site at: http://www.darsombra.com.